Sequins sparkled, peacock feathers quivered and scantily clad curvaceous ladies danced to a thumping Samba beat. 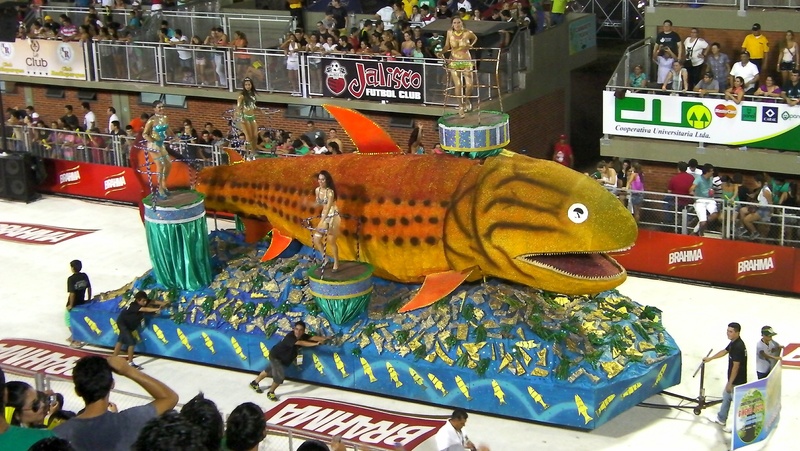 Elaborately decorated floats sailed past and muscle-bound men performed acrobatic moves to wow the audience. We had joined thousands of excited people to descend on the Sambadrome to party and the anything-goes celebratory vibe was completely infectious. 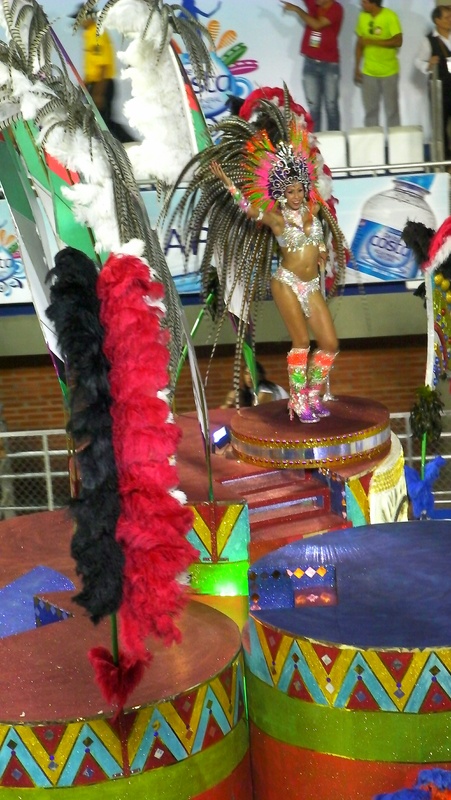 We’d always dreamed of attending Carnival in South America. The hedonistic image of streets thronged with carefree revellers, live bands playing every kind of music and beautiful ladies shaking their hips in tiny embellished bikinis filled us with passion. When people talk about Carnival, the first places which come to mind are the vibrant Brazilian cities of Rio de Janeiro and Salvador. Naturally outgoing and with a zest for life, Brazilians instinctively know how to have a good time making their parties amongst the biggest and best in the world. But there’s a new kid on the block! 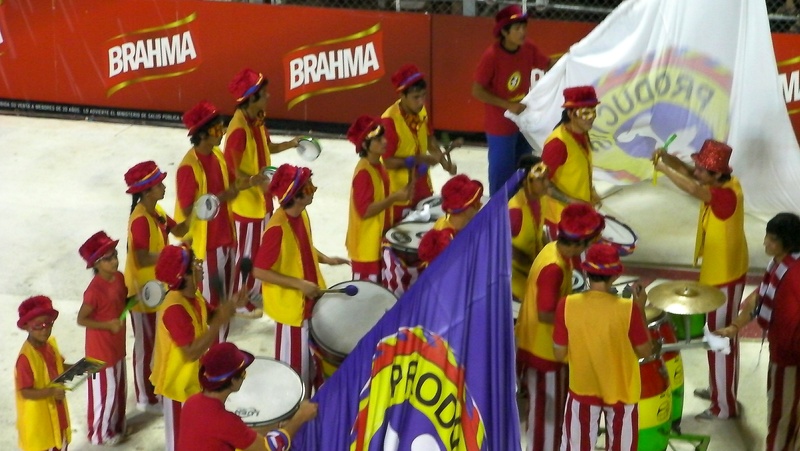 Coming up on the inside rail and demanding to be recognised on the world party scene, let’s make some noise for the ‘Capital de Carnaval’ – Encarnacion in Paraguay. 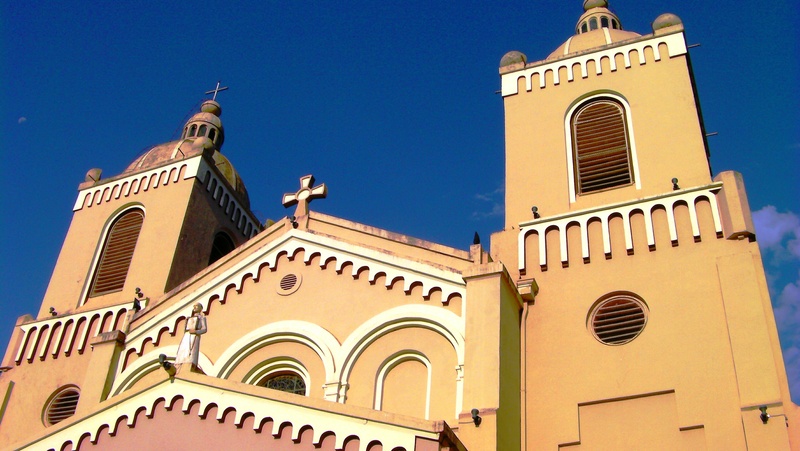 Encarnacion is Paraguay’s third largest city (population approx 94,000) and is located in the south-eastern corner of the country, across the river from Argentina. 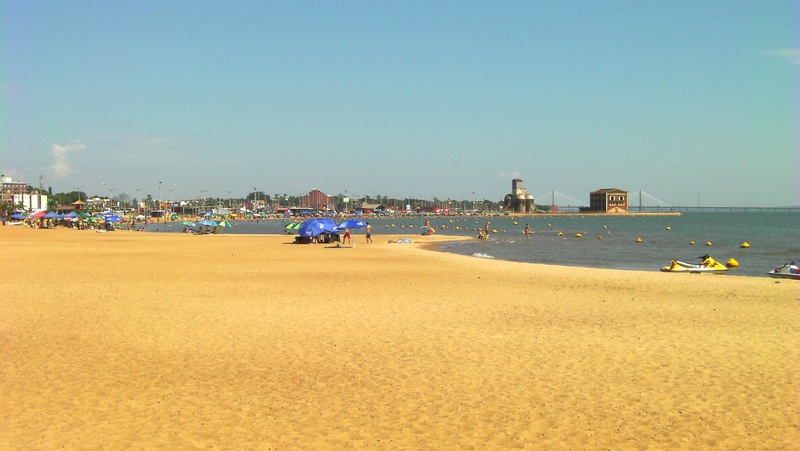 With its newly developed riverside promenade, tree-lined streets and heritage buildings, Encarnacion is Paraguay’s most beautiful city and is frequently described as the Pearl of the South. This quaint city initially seems like an unlikely candidate for the title of ‘Carnival Capital’, however, every February the city erupts into a fabulous, month-long celebration of music and dance. Each weekend during carnival month sees the laid back city come to life with an explosion of creative energy. Colourful parades, outlandish costumes, loud music and partying become the daily norm as the Paraguayans set out to prove their Carnival is the greatest show on Earth. More by luck than judgement, we arrived in Encarnacion a few days before a Carnival weekend got underway. 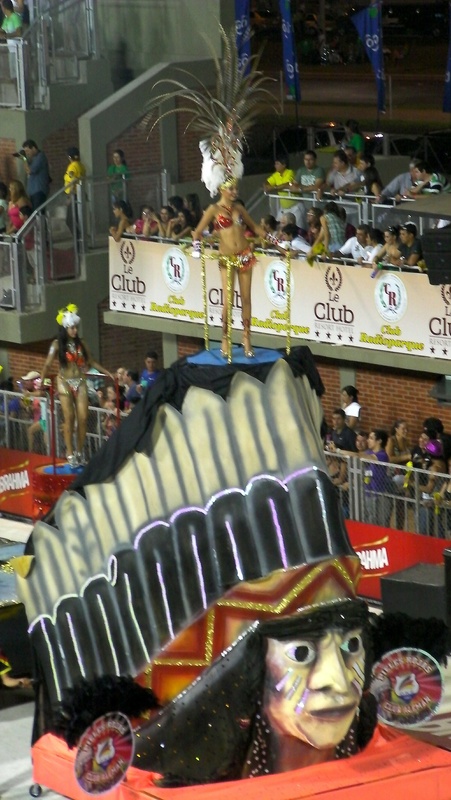 The tickets for carnival parades in Rio de Janeiro can cost hundreds of dollars or more, and need to be booked months in advance, so we were doubtful our impromptu arrival and tight backpacker budget would allow us to experience the joys of Carnival in Encarnacion. We were however, very pleasantly surprised. 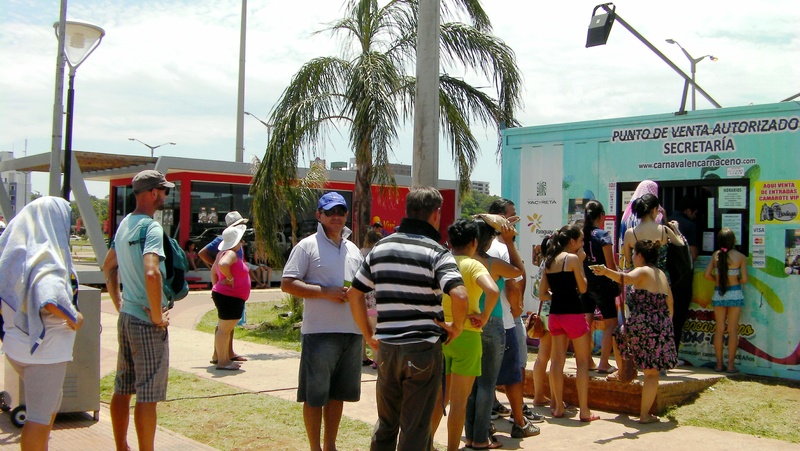 Tickets can be purchased on Saturdays from booths around the city and cost approximately $20 USD per ticket. The queues were long and the sun was hot, but one hour later, we were the proud owners of two tickets to the most glamorous event in town. 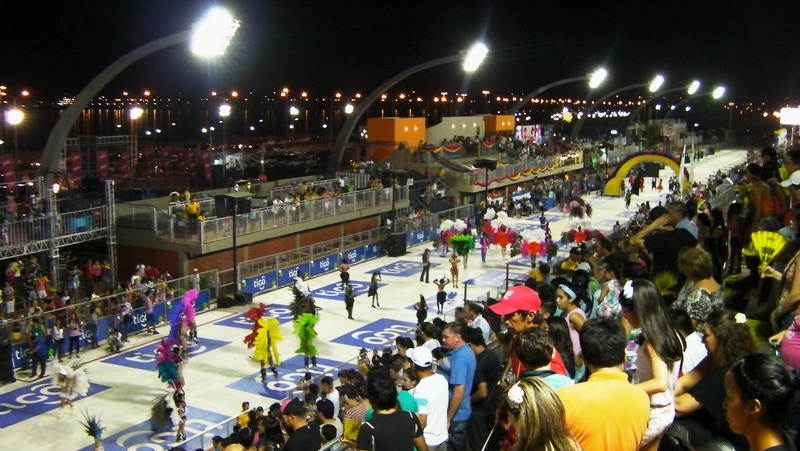 The ‘Sambadromo’ (carnival parade ground) is located along Avenida Costanera, and is best described as one of the longest and most outlandish runways in the world! 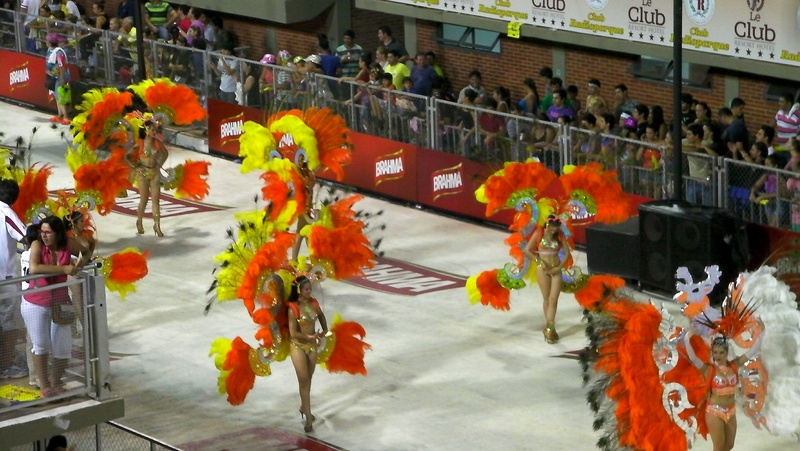 Down the middle of the concourse, samba schools strut their stuff. 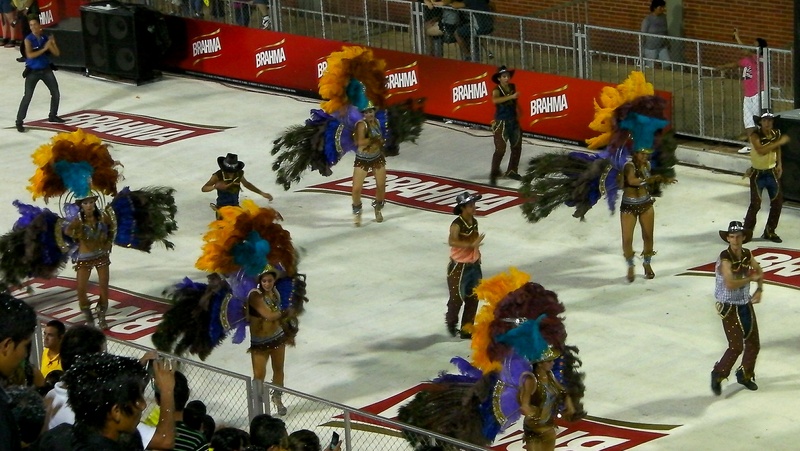 It’s like an all-night dance-off, where each Samba school performs harder and better than the last. Either side of the runway was flanked by stands holding thousands of revellers. We spotted a number of international tourists but by far the biggest crowd was made up of locals. Many people had brought their whole family to see the show and their kids twisted in circles mimicking the dancers in the parade. Vendors wandered amongst the crowds selling hot dogs and popcorn. Some shouted “Leche, Leche,” but they weren’t selling milk, rather cups full of strong, locally brewed beer. 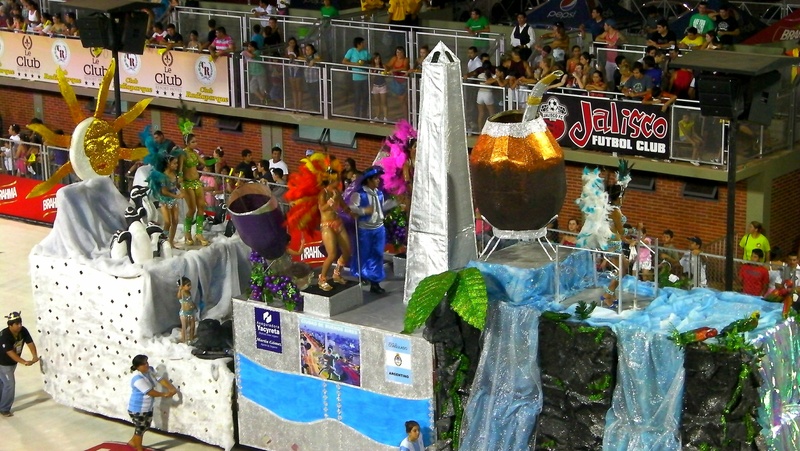 The schools spend months perfecting their costumes and performances in preparation for Carnival. The colours and detail of the costumes is extraordinary. Bejewelled beauties sparkled with golden glitter and sported headdresses three times their size. Dancers on stilts grooved to the beats and bare-chested cowboys blew kisses to the crowds. Tradition and history play a large part in the designs with themes drawn from the ancient Mayan and Aztec cultures. Others throw caution to the wind with wacky underwater or space age designs. Everywhere we looked flesh glimmered erotically with sweat. In many cases the dancer’s modesty was only preserved by a scattering of diamantes glued to their most precious parts!! It was a tropical assault on the senses. When the hyped up crowd momentarily become distracted from the main event, they playfully cover each other in “snow spray” from aerosol cans. Unsuspecting Gringos make for a good target but just go with the flow and enjoy the surreal moment. For those with the staying power, the Sambadrome buzzes into the wee small hours. For those needing to recharge their batteries, their path home is lit as fireworks flicker in the sky across the city. For those lucky enough to be swept up in the festival spirit, it will be an experience you’ll never forget. Carnival for us was a Bombastic mind-blowing spectacle, and one thing’s for sure, Paraguayans certainly know a thing or two about partying!